After checking into my hotel room, I ventured out to visit the Samadhi (tomb) Temple. The way to the temple is through a bazaar, full of shops selling flowers, sweets, incense sticks and other offerings for Baba, which lead you to the main darshan queue. Before proceeding towards the queue, one needs to deposit one’s footwear, leather bags, cameras and other electronic items at the counters outside. It has taken me even up to 6 hrs in the queue sometimes, but this time I got lucky as there was less crowd (probably due to the monsoons) and reached the Samadhi room in just about an hour. If you want to evade the heavy rush then avoid visiting the place on Thursdays (Baba’s day), weekends, and festivals of Guru Poornima, Ram Navami, Dusshera. While standing in the queue, you have T.V. monitors showing live darshan of Sai Baba’s Samadhi inside. The Sai Sanathan Trust of Shirdi which looks after the maintenance of the temple has done a pretty good job of managing a large number of people and also in keeping the temple premises clean. Amid chants of ‘Shri Sacchidanand Sadguru Sai Nath Maharaj ki Jai’, I entered the main room which houses the Samadhi and felt a breath of fresh air. The Samadhi hall is huge and spacious and the focal point of the room is the life-size marble statue of Sai Baba sitting on a throne. He was wearing a silky red robe, golden ornaments and decorated with flower garlands. “Shirdi is my own place of work where I had come 64 years ago. How can I go anywhere leaving this place? All of you keep your belief in me and be always sure that if I give up my body, my bones will always be inspiring new hopes and faiths among my devotees. Thus not only I, but my tomb too will speak with my devotees and will give them liberation from their sufferings. Those who will innocently come to my tomb and will worship and remember me at any place will have all their works done. Thus, they will get to liberation”. It’s faith in these eternal words He spoke at the time of Samadhi that has kept Him alive till date and continues to draw innumerable pilgrims from far and wide to receive His blessings. In front of His idol lies His final resting place, a marble platform - His Samadhi covered all over in huge garlands and sweet smelling flowers. After taking the darshan, I spent a few minutes in the room and fixed my gaze on His final resting place. He had padukas (slippers), chattar (umbrella), throne, mukut (crown) all in pure gold donated by His devotees from all around the world. Amid all this gold and grandeur, what was most striking though was Faith… faith of the hundreds around me who were coming in from different quarters belonging as they do to different castes, but speaking one universal language of love and peace. A God for some, a Guru (teacher) for others, Sai Baba was a living idol of knowledge, peace and mercy. One thing that particularly draws me towards Him is His message of ‘Sabka Malik Ek’ or ‘God is One’ and that He didn’t care what caste you are. Instead He just used to say one thing - Have ‘Shraddha and Saburi’ that is Faith and Patience in God. This gospel of pure unconditioned love which He expressed through selfless service has today been embraced by all religions, castes and age groups creating one big human family, sans any cultural boundaries. This is I believe the biggest miracle He performs, the miracle of unison. We then moved out of the temple towards the Neem tree in the premises where Sai Baba was first spotted in Shirdi as a young lad of 16. He often meditated here and referred to this place as His ‘Gurusthan’ (mentor’s place). Devotees light incense sticks here on Thursday and Friday with a belief that this will cure them of their ailments. Besides this, there are 3 other temples in the premises belonging to Lords Ganesha, Shiva and Shanidev and also a museum. It was very fascinating to take a tour of the museum and look at the Baba’s personal items like robe, sandals, gramophone, paintings, cooking cauldrons, etc accompanied with little snippets of His life. The temple opens at 4:30 am with morning Kakad aarti and closes down at 10:30 pm with Shejarti. On the occasions of Gurupoornima, Dusshera, and Ramnavmi, the temple is kept open overnight. On Thursdays and the above mentioned festivals, a Palakhi (chariot) with Baba's photo is taken out from the temple. Wonderful! i always think of taking photos at shirdi, but then i never carry either camera or mobile when i go to the temple, so there i never do... the next time i go there, i can simply link to your pics! What a fascinating post and to think people wait queue for so long. Sad to say many of us Btits would only wait like this in order to get tickets to see the latest bands or to be first in line at shop sales. You mention flowers and sweet smelling roses in particular, does the rose signify anything or is it popular because of its colours and scent? You're lucky having been there Arti! Such a remarkable guru and place, so important for our times. Thanks for posting this! i like this sentence of yours: "Amid all this gold and grandeur, what was most striking though was Faith… faith of the hundreds around me who were coming in from different quarters belonging as they do to different castes, but speaking one universal language of love and peace." wouldn't it be great to live in a world united with that kind of faith? That's a lovely gate. A six hour wait sometimes? Are there places to sit down? Nice post Aarti, very good narration, I have visited shirdi Ashram in Chennai constructed a la Shirdi style. But I wish to go to Sirdhi the original. @ ...Petty Witter Thank you Petty for your comments, always. 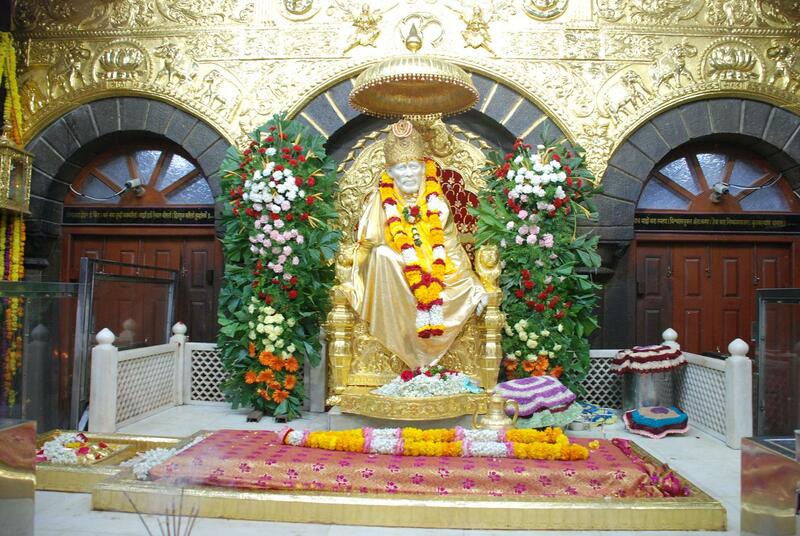 Red roses symbolize love and thats the reason devotees offer red roses to Baba as a symbol of their love for Him. @ Anu That will be an honour! Yes. There is a huge rush of people in Shirdi all year round, but the Shirdi trust has ensured the comfortability of the devotees by provision of seats in between queues, not only that they also arrange for refreshments and chips if you feel tired. @Chitra Thanks for your visits. I would love to see the Shirdi Ashram of Chennai too... I wonder if you have blogged about it ? Arti, I haven't . It is near to my house in Chennai. I would write about it. The samadhi room with the image of Saibaba then the wish tree, the eternal fire are all there. It's very near to the sea shore and many are fed there everyday. Wonderful shots. That golden spire is lovely! nice pics and great compilation. Nice post n thanks for sharing. Thanks for sharing, I love the pictures! Hi Arti. A beautiful post as always. I love the way you educate us; you make it easy to learn. The Baba's message is universal and encompasses what is good about all faiths. Some people sadly forget the message. Your posts always have such striking colors and wonderful narrations! Inspite of being so divine place, don't you think it has become too commercialized? 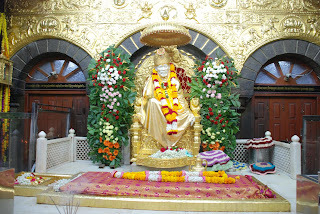 It has been my desire for a really long time to visit Shirdi, the place of his Holiness Sree Saibaba and I plan on doing that next time when I visit India..Thank you for the beautiful virtual tour! This was a good write-up of your visit to the temple. This is a temple visit long overdue. Very nicely presented. Interesting street shots.. I always like these kinda photos. It gives the reader a feeling of being there..On reading Chitra's comment, it just struck me that I can write about a wonderful Shirdi Sai temple near my place.. Numerous miracles have happened in this temple. I will obtain the permission from the trustee before writing and posting pictures..I hope I get the permission. Sairam...! Wonderful experience. I had been here in the December month and it was nice. I never tire of reading experiences about Shirdi Saibaba.I have visited the temple several times but every time I nter the main hall, I feel the presence and can hear the words he spoke. Lovrly post and pics. Arti perhaps i missed few of your posts in between, but this elated once again visually and intellectually. I feel like i am in shirdi. Thank you for all. Please Shirdi Saibaba Bless all ways on us. God who was in the presence of common men a few years back, inspires even after Samadhi.....Samastha Sadguru Sainadh Maharaj ki Jai!! !